The evolution of music « Nothing in Biology Makes Sense! The first idea is the easiest to understand – music didn’t evolve. It’s possible that music confers no evolutionary advantages or disadvantages, instead music is simply an artifact of our brain’s architecture. There may be underlying evolutionary tools that contribute to it, like tonality and the ability to keep time, but music itself is to these tools what cheesecake is to nutrient intake. A happy accident. The second is the view originally espoused by Darwin: music functions as a form of sexual selection. While today we think of music primarily in the context of professional performers, it’s possible that in primitive hominids it would have been practiced by nearly everyone. After all, even if you can’t sing opera, almost everyone can hum, whistle, or chant. Courtship within the community could have taken place over a very long time scale, long enough for prospective mates to correlate musicality to health, intelligence, or overall fitness. As for communal performances, those could be explained by the lek hypothesis: like a group of birds all singing together, they’re ultimately a way for a bunch of individuals to show off their talents at once. However, it’s also possible that it wasn’t individuals who really made the difference, but the group itself. This is the third main view. Genes and evolutionary traits can actually affect the fitness of an entire population. Humans are, after all, social creatures, and the success of your village may very well affect your own fitness, health, and children. Perhaps music evolved for communication or cementing community ties. Instead of picking lice off each other, early hominids sang. And not every individual would need to carry the good-music genes for the group selection hypothesis to work, just enough of the population to keep it around. Interestingly, it has been suggested that similar phenomena may be present in chimpanzee tree-drumming and whale song. 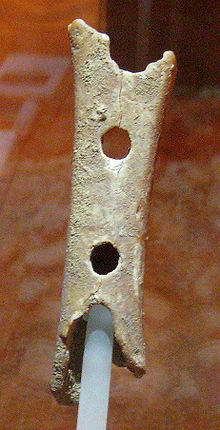 The flute was likely never actually played by modern Homo sapiens. It was created by Neanderthals. Cross, I. (2001). Music, cognition, culture and evolution. Annals of the New York Academy of Sciences. 930: 28-42. Miller, G. F. (2000). Evolution of human music through sexual selection. In N. L. Wallin, B. Merker, & S. Brown (Eds. ), The origins of music, MIT Press, pp. 329-360. This entry was posted in archaeology and tagged culture, human evolution, music. The post stops just when it was getting good! What sort of evidence is there, or could there be, for or against each of these three hypotheses? Alternatively, if the available evidence isn’t, and can never be, sufficient to distinguish these hypotheses, what’s the point of the post? Don’t leave us hanging!